You know what I love? Sugared almonds! That thick sugar shell and soft, sweet nut within - eat ten of them and your halfway to diabetes town, but I challenge you to just eat one. Not only are they delicious, but the look bloody lovely too - I would love a mini prom dress made out of sugared almonds, might be some bare flesh by the end of the day, having a little snack when I'm hungry. All those lovely candy shells in pastel shades are so hot right now - you can't move through the highstreet without feeling the sugary vibes from all the sweet shades. Usually I am a fan of greys or bold and bright, but I think pastel shades have won me over, I have already bought a pair of mint jeans and once I have more than lint in my pockets I plan to buy more....most likely on the realistic side of things. 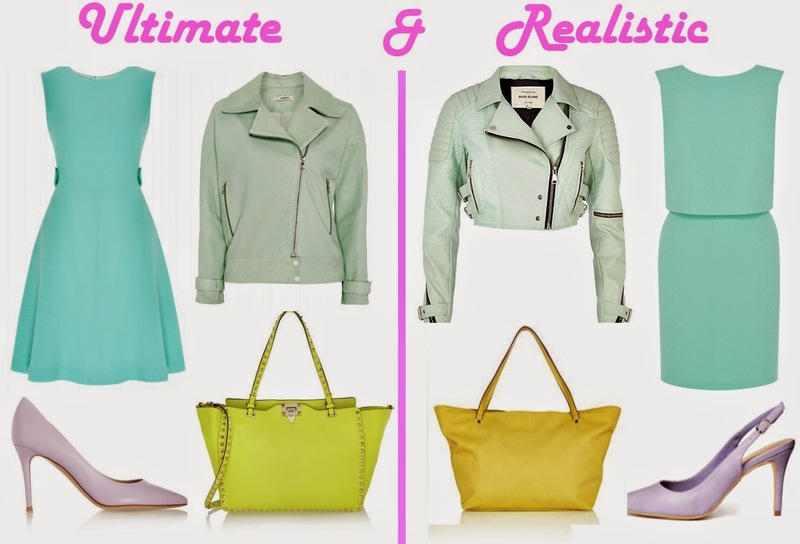 ULTIMATE: Tate Dress, Goat - £450; Durham Green Leather Biker, J Brand - £829.50; Leather Pumps, Gianvito Rossi - £415; The Rockstud Medium Neon Leather Trapeze Bag, Valentino - £1,465. REALISTIC: Lace Cape Dress, Warehouse - £58, Light Green Cropped Biker Jacket, River Island - £60; New Look Turret Purple Sling Back Heels, ASOS - £17.99; PU Shopper Bag, Next - £28. Just a saving of 3 grand, I'm not sure it's worth it! What do you prefer, the Ultimate look or the Realistic look? Oh my god I LOOOOOVE these posts so much! Your matches are absolutely brilliant as well! I love mint green at the moment. I'm wearing my mint green jeans to death. I prefer the ultimate jacket but the rest is realistic. You can do my shopping.